What happens when a vehicle is correctly aligned? If your vehicle is pulling to one direction or your tires are wearing unevenly, alignment may be the issue. A correct alignment is an affordable way to maintain your vehicle’s ride and extend the life of your tires. Plaza Tire Service prides itself in providing excellent alignment services at a price that fits your budget. With the Premium Alignment, you only pay one time for alignments to be performed on your vehicle for the entire time you own it. Just visit at the required intervals to keep your vehicle driving straight. Schedule an alignment at a Plaza Tire Service near you. Plaza Tire Service uses state-of-the-art alignment equipment developed and manufactured by Hunter Engineering, headquartered in St. Louis. In this video, it’s easy to see how premium equipment helps us provide the best possible alignment for your vehicle. When the top of the tire is tilted towards the inside or outside of the vehicle, instead of being lined up straight, the vehicle has incorrect camber. Incorrect camber has a significantly negative effect on the way a vehicle drives and it also contributes to improper tire wear. The vehicle will pull in one direction and the steering wheel will not remain straight. When the camber is not straight, the vehicle has to overcome added resistance against the road to roll. The added resistance keeps the vehicle from operating as efficiently as it should leading to increased fuel consumption. Walk on the inside or outside of your feet. You’ll notice how difficult it is to walk in a straight line and that it takes more energy to move. That’s what your vehicle experiences when your camber needs correcting. When the tire(s) point toward the center of the vehicle’s path, instead of pointing straight ahead, the vehicle’s alignment is toe-in. When the tire(s) point toward the outside of the vehicle’s path, instead of pointing straight ahead, the vehicle’s alignment is toe-out. 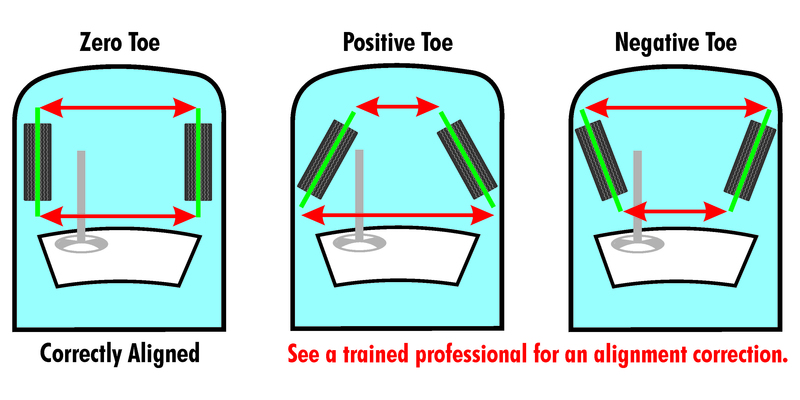 Toe-in has a significantly negative effect on the way tread wears, more so than the way the vehicle drives or performs. Toe-in results in faster tire replacement. When the vehicle experiences toe-in, the vehicle has to overcome added resistance against the road to roll. The added resistance keeps the vehicle from operating as efficiently as it should leading to increased fuel consumption. Walk with your toes pointed inward. You’ll notice how difficult it is to walk in a straight line and that it takes more energy to move. That’s what your vehicle experiences when your camber needs correcting. How can Plaza Tire Service keep your vehicle correctly aligned? Most tire and vehicle manufacturers recommend alignment corrections at least annually. They should also be performed when new tires are installed to protect your investment in new tires from the start. You can count on Plaza Tire Service for precise and accurate alignments to extend the life of your tires. Plaza Tire Service is home to the most state-of-the-art alignment equipment from Hunter Engineering and John Beam. These specialized machines and tools provide precise laser readings, detailed computer printouts and pin point measurements that are used for the most accurate corrections. 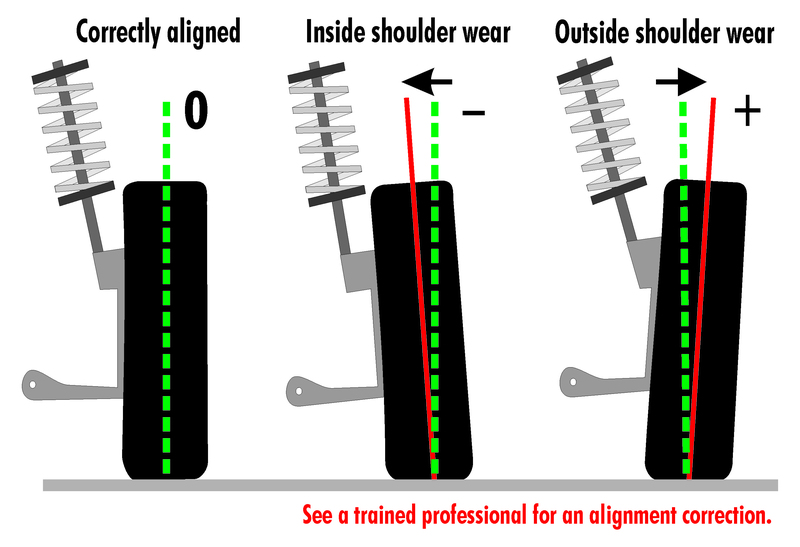 The best alignment equipment means nothing if the technicians using it cannot operate it, so Plaza Tire Service provides extensive training and regular updates to its alignment technicians. The combination of top notch equipment and skilled staff provide affordable protection for your alignment, vehicle and ultimately your tires. Plaza Tire Service also tracks your vehicle’s alignment history every visit you make. These detailed records are used to help you remember when your alignment’s periodic alignment checks and corrections are due. Give us your email address, and we’ll even send you alignment reminders based upon your mileage history.